I first gave up dairy products at the suggestion of an acupuncturist/OMD that was treating my sinus issues. She told me that dairy could contribute to mucus production. However, research has not shown that to be the case. To read the latest research on milk and mucus production, check out this study from the Journal of the American College of Nutrition, Milk Consumption Does Not Lead to Mucus Production or Occurrence of Asthma. 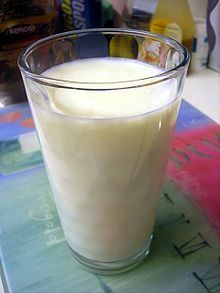 Many people are lactose intolerant and have had to find alternatives to cow’s milk. I now drink rice milk since I found out my family is prone to high cholesterol and rice milk has no cholesterol. I love the taste of rice milk, but I want to make sure I am getting my nutritional needs met. So I did some digging and found great info on rice milk and all milks in general and thought I’d share my results with my loyal readers! Nowadays, you can find rice milk, soy milk, coconut milk and even almond milk in stores like Whole Foods Markets and in many national grocery chains. Goat’s milk is available nowadays as well as some Sheep milk yogurt products. How do the different types of “milk” stack up nutritionally? This article from MSNBC, The skinny on milk nutrition: Cow, goat, rice or soy?, by Maureen Soloman, compares the nutritional aspects of these milks. Over at Fitsugar, I found this short article, Mooooove Over Cow’s Milk: Soy and Rice Milk Explained, comparing soy milk to rice milk. I take issue with the claim that rice milk uses sugarcane syrup as a sweetener (mine uses rice or rice syrup) but other than that, it’s a nice short primer explaining the differences between two forms of milk for the lactose intolerant. For more info on rice milk, here is a great post on the Pros and Cons of Rice Milk. from Fitday.com as well as a great post on Milk Vs Rice Milk, info differentiating the benefits of soy versus rice milk and rice milk versus almond milk. I also prefer goat’s milk yogurt to cow’s milk yogurt, mainly for its tangier taste. Then I found that goat’s milk is actually more nutritionally beneficial than cow’s milk as far as digestive and metabolic use of iron, calcium, phosphorus and magnesium. Researchers found that goat’s milk helps to prevent ferropenic anaemia (iron deficiency) and bone demineralization (softening of the bones). Check out info on that study at Science Daily here. Although rice milk provides less protean per serving (1 g versus cow’s milks whopping 8 grams), rice milk doesn’t have any cholesterol, and enriched versions are fortified with calcium, A, B12 and D vitamins and taste a lot like cow’s milk. Check out nutrition data for both skim milk and Enriched Rice Dream rice milk by reading their nutrition labels. Skim milk is lower in calories, carbs and higher in protean. Enriched rice milk is higher in phosphorous (15% for rice milk, 0% for skim milk), Vitamin B12 (255 of RDA in rice milk, none in skim milk) and fat (1.5 grams high in fat). Skim milk is slightly higher in Vitamin c (4% of your RDA versus rice milk’s 0%), and higher in sodium (105 mg for rice milk, 130 mg for skim milk). Rice milk is slightly higher in calories too (120 original, 130 vanilla to skim milks 9- calories). Skim milk nutrition label here. Enriched vanilla rice milk (My personal fav) Rice Dream nutrition data here. 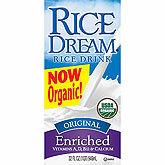 Original enriched rice milk from Rice Dream nutrition data here.